When I moved into my current rental, they have lace curtain in the kitchen. I love lace, but these were stained, moth-eaten and tattered. We have one of those post-war houses which are so common in Brisbane. It could be kitsch if it weren’t entirely cream with lino and chipboard throughout. In an effort to put some personality into the place, I whipped up some simple curtains which I think look pretty spiffy. 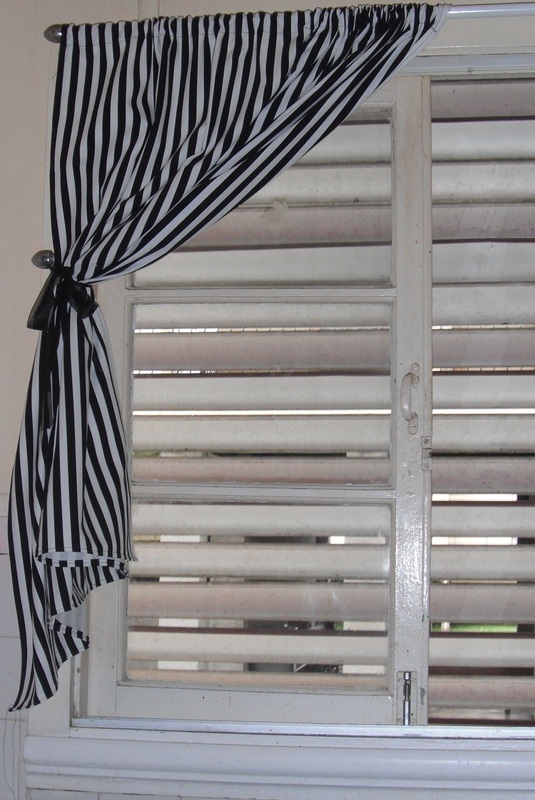 Curtains really can be so simple to make. Unfortunately, I think the cost of decent fabrics, the trend towards ceiling to floor windows and the effort to wash them, means fashions have moved towards blinds. However, I find curtains less sterile and can add more unique style to a room. I cut a thick, stiff, cotton fabric 1.5 times the length of the windows across and about 6 inches longer. If I did them again, I probably would have cut them twice the length to allow for more gather when they hung. I hemmed all four sides of the squares using a rolling hem, then pressed over the top edge enough so that the rods would be able to fit through and sewed it down. I simply used some regular ribbons as ties. Consider how much gathering you want before cutting. Curtains need a significant about of overhang to be effective.